The £2 discount doesn't apply to bundles I think or hardware, I forgot exactly what it was again but don't expect the prime discount in the future for the bundle. Nothing special, game is available for under £40. Pokeball is only £45 but was cheaper with that E3 code, still cheaper than this without it though. 90 GBP. Where is the deal. ? Some of us use this website as stock notification for extremely difficult to attain items I for one am thankful because I've been waiting for this listing for ages. A deal isn't necessarily about a low price. Sometimes a deal is a deal if it's the only way that you can attain a limited-availability item. I don't see why this isn't a more widely accepted philosophy of HUKD, truly. Probably the only way they can get people to pay £40+ for a 1/4 of a Joycon. Appreciate the post, but it's not a great deal imo. And I think the pokeball plus is available for £45 several places isn't it? Heat for informing me. 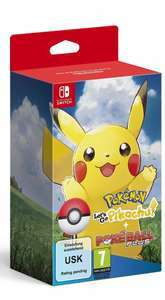 Ive pre ordered the bundle and a additional pokeball. So when it gets closer to the release I'll have the option to pick which one has the best price reduction. If they don't go to a competitive price I'll just buy digital for convience. Ooo I didn't know that promo was still going Thanks ! Do you pay straight away or on dispatch? The games are £39.85 from base.comAnd I think the pokeball plus is …The games are £39.85 from base.comAnd I think the pokeball plus is available for £45 several places isn't it? Yup the games are £40 on Base and the Pokeball is £45 on Amazon / Game. Probably is a deal based on the RRP, however not with the pre-order price's out at the moment. Probably the only way they can get people to pay £40+ for a 1/4 of a …Probably the only way they can get people to pay £40+ for a 1/4 of a Joycon. I just bought a Ford fiesta at twice it's retail price. Crazy to some but if they have none next year when I actually want it, it will be a bargain. I just bought a Ford fiesta at twice it's retail price. Crazy to some but …I just bought a Ford fiesta at twice it's retail price. Crazy to some but if they have none next year when I actually want it, it will be a bargain. Did you pay up front for your fiesta? Brrrr. Posted by Ben Shivers. Will pre order just incase of a price drop between now and launch, otherwise I will just cancel and buy from wherever is cheapest. Deal posting newbie! This is ben.chilvers first deal post. Help out by leaving a posting tip or just to show your appreciation for their contribution.